Stowe was born Harriet Elisabeth Beecher in Litchfield, Connecticut, on June 14, 1811. Her parents were religious leaders Lyman Beecher (a leader of the Second Great Awakening) and Roxana (Foote) Beecher. Her mother died when Harriet was five years old. She had a sister, Catharine Beecher, who was an educator and author, and three brothers Henry Ward Beecher, Charles Beecher, and Edward Beecher. ↑ David B. Sachsman; S. Kittrell Rushing; Roy Morris (2007). Memory and Myth: The Civil War in Fiction and Film from Uncle Tom's Cabin to Cold Mountain. Purdue University Press. pp. 2, 8. ↑ "Harriet Elizabeth Beecher Stowe (1811 - 1896) - Find A Grave Memorial". 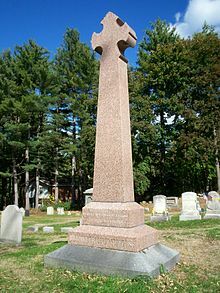 Findagrave.com. Retrieved 2012-07-08. Wikimedia Commons has media related to Harriet Beecher Stowe. Meet Harriet Beecher Stowe, renowned author of Uncle Tom’s Cabin – A live performance showcasing the life and times of this historical woman. This page was last changed on 2 July 2018, at 23:26.